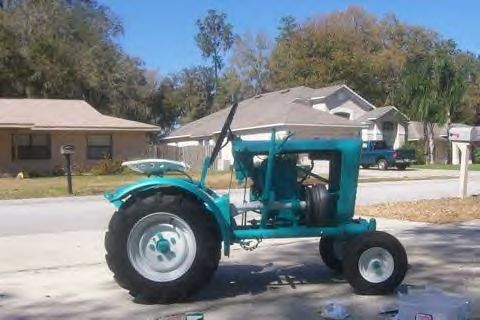 I recently moved to Florida to be closer to my family and escape the NE Ohio winters As a toddler my grandma would take me out to tend the fields with her , so tractors and farming I have always been a part of my life .My younger brother Tony kept ranting and raving about this garden tractor he saw at the Flywheels Tractor show so I hopped in the truck and off we went to see it .It was a Panzer T-75 and a Copar 102 .I the mechanic of the family loved the tractor and told him maybe we could restore one someday I helped grandpa restore 6 Ford 8-n's and several Cubs so I knew this would be easy. After the show in November I hit E-bay looking like a hawk and a few days before Christmas It came on ,a T-70 B located just 50 miles from us in Florida .I contacted the man who owned it and on Christmas eve picked up my brother and said I had bought us a tractor .I swear we were like kids going to get a toy . The next month was a great family time ,at night we would all get together and do a little sanding or painting and the kids quit watching TV and had fun helping fix the Panzer up .I know it is sappy but it brought the whole family together and some of the neighbors too .God works in strange ways . I did not know that it would lead to me getting this involved as I am now co-owner of the panzer group on yahoo and looking for several more tractors to restore .But if you read my story I will tell you that any guy I have met in person or on line that has a panzer is a good person and will help you out however they can and in this day and age that is rare .The beauty of a panzer is you can fit it in a shed or garage so city or country you too can own the best little tractor ever made . In the end Christmas is about family and this was the best Christmas present I ever bought because it gave us a tighter bond and a better understanding of each other .